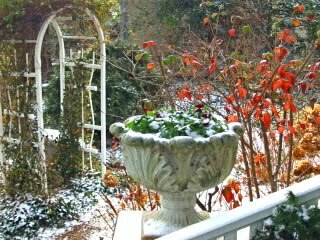 Abbington Green Bed & Breakfast Inn, Asheville NC: Abbington Green Bed & Breakfast Inn, Asheville NC: For Holiday fun, "Let it Snow"! 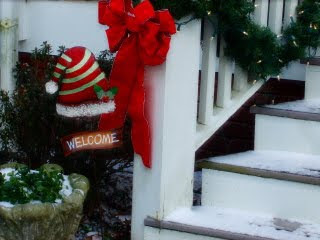 Abbington Green Bed & Breakfast Inn, Asheville NC: For Holiday fun, "Let it Snow"! Well, as we say in western North Carolina, "Let it Snow! Let it Snow! Let it Snow!" Especially, I am always quick to add, "designer snow". You know, that's the kind that dusts the tree branches and the ground lightly, but generally leave the roads in very good, drivable condition. Last night Asheville, North Carolina got another lovely dusting. No mistake, it's cold! But the snow brushed off the car very easily, no shoveling was required for the bed and breakfast porches and stairs and the grassy hills down the block in Montford Historic District Park were just beautiful this morning. There's still a flurry or two around and in the next few days the high temperatures will be back in the 40's. But for now, take a deep breath and a brisk walk in Asheville, NC to look at Holiday decorations. I think you'll be glad you took the time to do it!